As reported by USA Today; Panama City Beach, Fl recently established a new World Record for the World’s Largest Bikini Parade. Following the success of the record attempt, the vacation destination has been placed in the National and International spotlight, with other beach destinations expressing an interest in dethroning Panama City Beach as soon as possible. Locals are hopeful this attention will result in an ongoing record battle, resulting in a fun beach experience enjoyed by everyone. Being the place that brought a new World Record to America for the first time is the icing on the cake. USA Today recently reported that, on March 6th 2012, Panama City Beach Fl, already know as having the World’s Most Beautiful Beaches, entered the history books by establishing a new record for the World’s Largest Bikini Parade. Philip Robertson was the official Guinness representative present on the day, to ensure the record attempt was official. 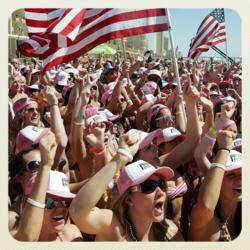 450 women, all wearing bikinis, marched along a one-mile stretch of the most sugar white sand known to North America - Panama City Beach, Florida. Dan Rowe of the Panama City Beach Tourist Development Council (TDC) set out to beat the record during the Spring Break 2012 season. “It’s a way for the students to come down and participate in a fun activity,” according to Rowe. “It is good clean fun.” Event organizers persuaded Spring Breakers staying in Panama City Beach hotels for Spring Break to roll out of bed early, and get to the designated meeting point to register for the World Record attempt. In March of 2012, Panama City Beach also played host to Fox Nation’s senior editor, Jesse Watters. Watters and his film crew interviewed Spring Breakers staying at the Sandpiper Beacon Beach Resort, and other Panama City Beach hotels, asking Spring Breakers vacationing in Panama City Beach about their political views and thoughts of current US President Barack Obama. The footage was later aired nationwide during Fox News’ ‘O’Rielly Factor’. Local businesses are hopeful this increase in media attention will generate more interest in Panama City Beach as a whole, including the all-important Summer-beach-travel season, as well as 2013 Spring Break. “Being home to the ‘World’s Most Beautiful Beaches’ has always been Panama City Beach’s claim to fame, but being the place that brought a new World record to America for the first time is the icing on the cake” according to Patrick Hazard, General Manager of the Sandpiper Beacon Beach Resort - a Hotel in Panama City Beach. 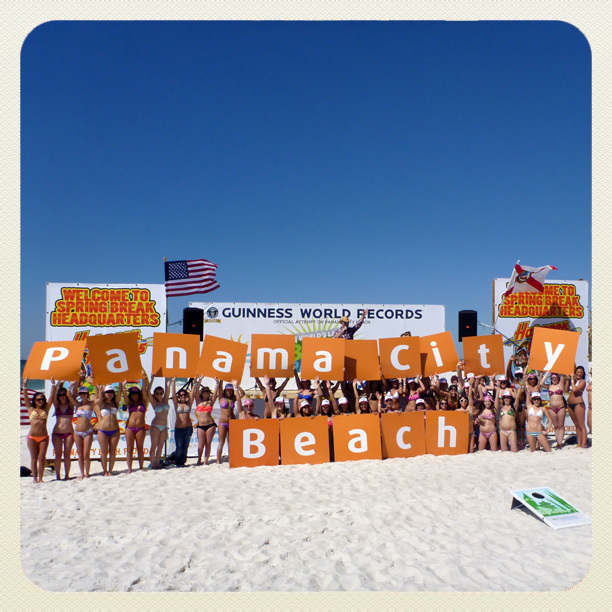 Should another contender come along to claim the World record as their own, it seems that Panama City Beach will be quick to respond with another challenge to claim it right back.